Arguably the most wonderful object found at Sutton Hoo was the ship. It was certainly the most valuable object from the point of view of the people who put it there, even though they heaped the Crown jewels on board as they buried it. It is a unique craft. It is huge and it is impressive, yet most people have no idea what it looked like, nor how it was constructed, handled or maintained. We have no other similarly complete craft for 250 years before it, or for 250 years after it. How fortunate we are to have the wonderful treasure in this awe-inspiring ship buried here near Woodbridge. We can go to Sutton Hoo to look at the displays and learn about royal life in those early times. Except, we cannot see the ship as all the timber used in its construction dissolved away in the acid soil. The 1939 and later excavations, allowed the basic structure of the ship to be recorded by the Science Museum and now there is a plan to use this knowledge to build a full size replica, in a purpose-built hall at the waterside in Woodbridge as part of a projected redevelopment of the derelict Whisstock’s boatyard close to the Woodbridge Tidemill. The building of the boat will involve using authentic tools and Anglo-Saxon methods as closely as we understand them today. The work, which has the approval of the National Historic Ships organisation, could be supervised by experienced staff from the International Boatbuilding Training College. This drawing is called the Jacobs Drawing. It is dated 1982. It is to be found in Tranmer House at Sutton Hoo, but it is water damaged. A similar copy can be found in the bar of The Anchor pub just opposite to Woodbridge station. Enter the front door of the pub, turn left and it hangs on the wall to the left. Building the ship will generate an outstanding opportunity for local young people to become involved in a project that will have national and international interest and links. The educational prospects are enormous for primary school children as well as university academics and all stages in between. What an exciting project this could be. Imagine the thrill of being able to go aboard her, hold the tiller and pull on one of her oars. The waterside development will bring this possibility one step nearer. Woodbridge’s Royal Rowing Barge AD 625. During the Diamond Jubilee celebrations all eyes in Britain were focussed on the newest royal rowing barge ‘Gloriana’ (with ‘discretely housed’ 19HP electric motor) as it led the pageant parade on the River Thames. Just less than 1400 years ago in 625 all eyes were on the River Deben near Woodbridge as the Anglo-Saxon king Raedwald’s death was marked by hauling his royal ship up to its burial site at Sutton Hoo on high land overlooking the Deben valley. The Anglo-Saxon ship excavated at Sutton Hoo in 1939 was 27 metres long, virtually the same as the current royal rowing barge. The modern barge is the longest rowing boat in Britain and is powered by 18 rowers. She achieved 9 knots in trials, so imagine the performance of the Sutton ship which had up to 40 muscular, fighting men at the oars, capable of driving her hard and fast. Essentially these men gave her the most powerful ‘engines’ of her day, so they could attack swiftly, striking well inland up shallow rivers. She had such a shallow draught that she could run straight up the shore and deliver her crew directly onto the firm ground; heavily equipped and armed to the teeth. Imagine the fear that she was capable of generating amongst surprised, shore-side communities. Within a short while she could extract her crew from the land and swiftly disappear again to sea. The new barge is richly decorated with carving and gold leaf and heavily loaded with a sumptuous cabin, but the Sutton Hoo ship was plain, lean and functional. Her smooth planking made her the stealth fighter of her day; she was the primary tool to project the king’s power and his authority … until she was buried. Then she was loaded with the Crown jewels of her day and all the artefacts that the king would need in his afterlife. In total she was, and still is, much more valuable than her modern counterpart that cost a mere £1m to build. How fortunate we are to have this wonderful treasure in this awe-inspiring ship buried so near to us, so that we can go and look and learn about royal life in those early times. We can see some of the actual treasure in the British Museum where a new display is in the planning. Very close to home, at Sutton Hoo, we can learn about the many valuable finds and walk through a replica of the king’s burial chamber, but we cannot see the actual ship, for in its time below the earth all the wood dissolved away, leaving only its detailed impression in the ground. This is the Nydam ship. It was intentionally sunk in a shallow lake in Denmark nearly 300 years before the Sutton Hoo ship was buried. Its appearance is close to that of the Sutton Hoo ship. See how sleek and functional it is. 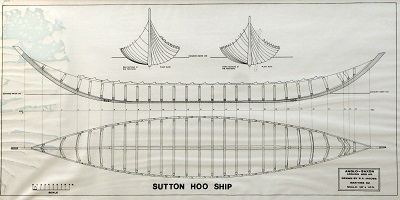 The Sutton Hoo ship is unique in maritime history, because she was an Anglo-Saxon ship. We have several replicas of Viking ships, but we don’t have Anglo Saxon ones. She is big and she is different. What an exciting project this could be for all of us. Perhaps you should know more about it? and was eventually sawn into 3 sections for storage. It is now in the National Maritime museum, Greenwich. The modern version ‘Gloriana’ is 26.25 (88ft) long, built 2011/12 and has 18 oars.